"When you're born in prison, you don't know what to do with the freedom." 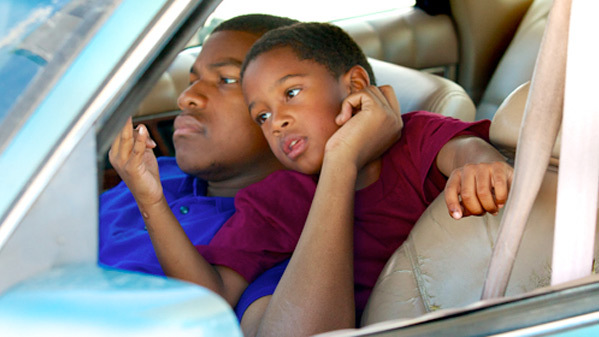 Netflix has debuted a trailer for the indie drama Imperial Dreams, starring John Boyega, better known as Finn from Star Wars. Before he went on to make The Force Awakens, Boyega made this indie film with Los Angeles director Malik Vitthal, starring as an aspiring and gifted writer who returns home to his neighborhood after being in prison for two years. He dreams of a better life for himself and his 4-year-old son in this hopeful depiction of inner-city life. This premiered at the 2014 Sundance Film Festival, three years ago, and is just now getting released thanks to Netflix. This looks pretty damn good, might be worth checking out even a few years late. A 21-year-old reformed gangster's devotion to his family and his future is put to the test when he is released from prison and returns to his old stomping grounds in Watts, Los Angeles. Filmed on location in the Imperial Courts projects outside Los Angeles. Imperial Dreams is directed by up-and-coming American filmmaker Malik Vitthal, making his feature directorial debut after a number of short films previously; Malik is a graduate of USC's School of Cinematic Arts. The screenplay is written by Ismet Prcic and Malik Vitthal. This first premiered at the 2014 Sundance Film Festival, three years ago. Netflix will finally release Vitthal's Imperial Dreams streaming online starting February 3rd, 2017 this winter. Anyone interested? He is going to be a big shot actor. More than just Finn. This looks powerful man. Almost brought tears to my eyes just watching the trailer. Solid film making right here.